"Oh, but what I would not give to have even a single company of Prometheans here right now... oh, they would most certainly restore order with their trademark lethality..."
— 343 Guilty Spark musing to himself as his Installation is about to be destroyed. The Prometheans were the highest and most respected group of Warrior-Servants in the Forerunner ecumene. During and after the human-Forerunner wars, they were led by the Didact. The Prometheans' main base of operations was the shield world known as Requiem. In the endgame of the Forerunner-Flood war, the Ur-Didact converted his Prometheans into machine-based intelligences, known as Knights, by using the Forerunner machine known as the Composer. These constructs, along with the Ur-Didact, survived the activation of the Halo Array, eventually awakening within Requiem and rising to oppose the UNSC in 2557. The Didact, the commander of the Prometheans, in his original form. Physically, Prometheans were the highest form a Warrior-Servant could mutate to. With a height of 350 centimetres (11 ft 6 in) or more, a fully mature Promethean was two times the height of a Forerunner Manipular and weighed about four or five times a Manipular's mass. They were heavily muscled, their hands capable of easily crushing a human. Their mental capabilities were also very sophisticated; Prometheans—and Warriors in general—perceived reality in a markedly different way from baseline Forerunners or humans, particularly during battle when their mental processes were at their peak. Thousands of Prometheans shared their sensory information with their commanders and individual Warriors observed the battle unfold in a number of separate frames of reference whilst their experience of the surrounding world slowed down, allowing them to perform multiple separate tasks simultaneously and granting them a significantly faster reaction time than baseline Forerunners. This heightened state of perception is somewhat comparable to—although considerably more powerful than—the "Spartan time" experienced by the SPARTAN-II and SPARTAN-III supersoldiers due to their neural enhancements. Promethean warriors utilized an assortment of combat skins, ranging from various conventional battle armor designs to much larger models, including midsize fighting suits known as war sphinxes; more akin to vehicles than armor, they possessed enough firepower to destroy cities. In large-scale engagements, individual Prometheans could control automated phalanxes of up to a million weapon-ships. Prometheans organized their forces into legions, companies and tactical squadrons. The Prometheans were responsible for creating "Warrior Keeps" known as Cryptums, where an exiled warrior could live in suspended animation for thousands of years. The Ur-Didact and his Promethean constructs at the Composer's Forge. "The human essences will go where all but one of my Prometheans have already gone. Their loyalty is now past question. They are our only hope against the parasite." — The Ur-Didact explaining his scheme to the Librarian. The mechanical Prometheans are war machines created by the Ur-Didact after his descent into madness near the end of the Forerunner-Flood war. The Didact viewed these constructs as a novel and effective strategy to fight the Flood without risk of biological infection. They encompass various classes of leader units known as Knights, standard ground forces known as Soldiers, specialized Sentinels known as Watchers, and small, pack-oriented Crawlers designed to overwhelm the enemy from different directions. These Prometheans were first encountered by UNSC forces and Jul 'Mdama's Covenant faction on Requiem in July 2557; the constructs encountered on the shield world are sometimes exclusively referred to as the Prometheans of Requiem. The AI of each Promethean Knight is based on the neural pattern, or essence, of an individual organic being, extracted and converted into machine data by the Composer. The original Knights were created from the Promethean warriors still loyal enough to the Ur-Didact to willingly comply with his scheme. However, though these Knights proved an effective force against the Flood, their small numbers made no difference in the war at large. 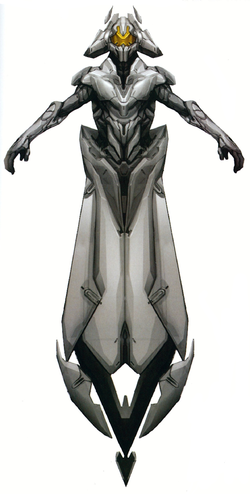 Desperate for greater numbers, the Didact composed Omega Halo's transplanted human population and used their essences to create hundreds of thousands more Knights; he also saw this as a way to neutralize the humans whom he saw as a threat, and to further punish them for their past aggression. Various types of Promethean Soldier. The mechanical Promethean forces also include constructs known as Armigers. Unlike the Knights, Armigers operate through artificial intelligence instead of composed organic beings. The Didact issued the use of a certain type of Armiger called the Promethean Soldier to fight alongside his forces. The Promethean Soldiers are proficient in close quarters combat and so were used for the raiding of ancient human ships during the human-Forerunner war. After the Didact's exile, the ecumene found themselves dangerously unprepared for the return of the Flood and so recommissioned the Armigers. While most Armigers were fighting the Flood, some were tasked with guarding key Forerunner sites in the event the Halo Array was fired. Unlike most Forerunner technology, which is chiefly angular and geometric, these Promethean machines have a more curved, almost organic aesthetic. Various Promethean units, including Knights and Watchers, have distinct heads embedded in their mechanical carapaces, complete with stylized facial features; this feature was shared by the war sphinxes used by the original Prometheans. Correlating with their role as weapons designed to fight the Flood, the Promethean machines' weapons arsenal was specifically tailored to disintegrate targets to prevent the Flood from repurposing any available biomass. Mechanical Prometheans have the ability to repair and improve Forerunner weapons. After the Requiem campaign, many alterations were made, such as tracking rounds for the Z-110 Boltshot and Z-130 Suppressor and dual-beam emitters for the Z-750 Binary Rifle. A squad of Prometheans storm a human capital ship. For thousands of years, the fortified shield world Requiem served as the main command center of the Prometheans. Following the Human-Forerunner War and the discovery of the Flood, the Prometheans, under the leadership of the Didact, stood in opposition to the radical faction of Builders led by Master Builder Faber. The Builders proposed the construction of the Halo Array as the ultimate weapon against the Flood, should they return, while the Prometheans advocated a more conventional solution: numerous shield worlds constructed in strategic locations, used as enormous refuges and fortresses. After several millennia, the Prometheans lost the political battle and were subsequently removed from the Ecumene Council, with the Master Builder's allies rising to power in the Council instead. Disgraced, the Didact and some of the other highest-ranking Prometheans were allowed the dignified choice of exile in a Cryptum, while some of the lesser-ranked commanders were accorded more severe punishments. Out of fear of Builder persecution and losing their prestige, many former Prometheans joined the Builder rate, enlisting in Builder Security. After a thousand years of exile, the Didact was reawakened amidst the Forerunner-Flood war. Shortly after his revival, a radical shift occurred in the Council and Faber lost his political power, due to his crimes against the Mantle. Called upon to defend the ecumene against the onslaught of the Flood, the new Council elevated the Prometheans back to their former status. With the Didact believed to the dead, his imprinted double, known as the IsoDidact, took up his place as the supreme commander of Forerunner military forces. Requiem, the primary fortress world of the Prometheans. Under the new Didact's leadership, the Prometheans would lead the ecumene's defenses against the Flood until the end of the conflict and the activation of the Halo Array. Near the end of the war, the Ur-Didact was revealed to be alive and was returned to the ecumene. 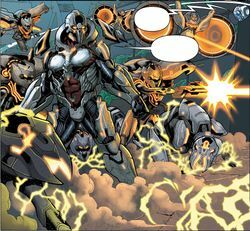 Still adamant in his opposition to the Halo Array, the Ur-Didact returned to Requiem with a small number of Promethean warriors still loyal to him, where he began to devise new, more extreme methods of combating the Flood. After failing to discover a way to immunize biological beings from the parasite, the Ur-Didact used the Composer to convert his Prometheans, as well as a large number of humans, into powerful robotic forms immune to infection. Viewing the Ur-Didact's "conscription" of the humans as a severe transgression, the Librarian locked him in a Cryptum on Requiem and sealed off the shield world. She also took control of the mechanical Promethean forces stationed on Requiem, tasking them with preventing outsiders from awakening the Didact. In July 2557, over four and a half years after the end of the Human-Covenant War, John-117 and Cortana, drifting aboard the wreckage of the UNSC Forward Unto Dawn, came across Requiem. They and forces from Jul 'Mdama's Covenant faction were forcibly pulled into Requiem and crashed on the surface, and were soon after engaged by the Promethean constructs inhabiting the shield world. After John-117 accidentally awoke the Didact, the latter retook control of the Prometheans. Bent on preventing humanity's ascendance to the Mantle in the Forerunners' place, the Didact went to war with humanity, attempting to use the Composer to neutralize his ancient enemies forever. The Prometheans and Covenant remnants aided in this plan, but with the help of the AI Cortana, the Master Chief defeated the Didact and destroyed the Composer and his ship Mantle's Approach with a HAVOK tactical nuclear weapon. The Didact and the composed essences survived, however, and the extracted human mentalities were soon implanted into more Promethean Knights, which attacked UNSC forces on Installation 03 and later in the Composer's Forge, only a day after the Didact's attack on Earth. While the Didact was eventually defeated and "contained" as a threat, most of the newly-created constructs were evidently sent to Requiem and continued to oppose the UNSC forces when the UNSC Infinity returned to the shield world in February 2558. While Requiem was eventually destroyed, a number of Promethean constructs survived and would later clash with the UNSC in the battles of Oban and Aktis IV, still allied with Jul 'Mdama's Covenant. By the time of the Battle of Kamchatka Promethean constructs had turned against Jul 'Mdama's Covenant, led by the Warden Eternal and Cortana, founders of the Created. The Promethean constructs are color-coded based on the individual in command of them at the time; blue is used to represent the Librarian, while the Didact is represented by orange. Prometheans with blue lights only appear in the level Forerunner, until the Didact takes control of them in the final cutscene. Despite this, there is no in-game difference between the way the orange or blue Prometheans behave. The name "Promethean" was probably inspired by the Titan Prometheus in Greek mythology, who gave the gift of fire to mankind. As the Forerunners predated the Greeks by well over 100,000 years, there is no in-universe relation between the names; however, the name was likely picked by the automated translation systems utilized by the UNSC in deciphering Forerunner-era languages. The translators replace many of the original Forerunner terms with contextually similar equivalents from modern humanity's history, culture and mythology, explaining the apparent Forerunner use of the human term. "Promethean" was one of the names Doctor Halsey considered for the SPARTAN-II program. 343 Industries franchise writer Jeff Easterling has implied that the Promethean constructs encountered in the games may be less powerful than their canonical counterparts for the purposes of gameplay balance. In the Spartan Ops CGI episode Invasion, Sarah Palmer destroys Knights with single shots from her M6H magnum pistols; Easterling implied that this feat is also non-canonical. John-117 facing the Didact's Cryptum. The Ur-Didact against John-117, a Spartan-II. Size comparison between various Prometheans and John-117. Various Prometheans part of the War Games simulator aboard the UNSC Infinity. Several forms of Prometheans in combat.